This week we are working on Curvy Stars. and by that I mean, curves, like part of a circle. Umm, no, not me, not going to do it. Curves have scared me, I really am fine not doing this week’s block. I will just watch and admire everyone else’s blocks. But, then I talked myself into giving it a try, after all, only I am going to see this quilt and if the blocks turn out kind of wonky, it will only be me that knows and I’m not perfect, so what can it hurt to try? Right? I carefully cut out my pie and crust blocks and started sewing them together. Melissa did a great job explaining how to sew the curved edges together. Here it is, all sewn together, not too bad. Before I knew it I had the two parts of the block done (the inner Drunkard path (curvy star) piece) and the outer large flying geese parts. That wasn’t too hard after all, I’m glad I tried it. I don’t think I would want to make a full quilt out of them, but for a few blocks in this quilt, sure, I will do them. Then I got to the hard part. I have realized I am not that creative-minded. I think I have NO left part of my brain. I struggle to put colors together to get a good contrast and hue difference. I tend to want to put same colors together, reds with reds, blues with blues. But I am trying to do less of that. So, I had to decide which inner star do I put with the outer blocks. So, I laid them out: Here’s the same inner curvy star with two different outer flying geese. I would normally put the outer blue with the inner blue, but I’m trying to challenge my brain into pretending to be creative, so I didn’t want to do that. I was leaning toward the red flower, but then another curvy block got finished that I decided looked better with the outer red, so I ended up going with the red polka dots. What did I finally end up with for these three blocks? I really like the silver but it tends to blend in with my background so I put it with the brighter red to help it show up. Do I think that worked? Well, mostly. But I am thinking of putting that silver with some of the darker blue from the other line that I am sewing with to help that show a bit more. Watch for that in a later star block. I’m not 100% in love with them, but I think I’m about 99%. I need to work on contrast and hue, but I love the fabric and I love the design so I’m pretty happy with these three blocks. So, then I started working on the second fabric line I am using for this quilt a long. I’m really thinking the rest of the blocks need to be smaller or this isn’t going to fit on my design wall! See that bottom blue with white center. It’s actually a white with blue polka dot center. It’s prettier in person but doesn’t show up well in the picture. I still have to decide what I want to do with my block from last week that I don’t like. And I need to finish the Vintage Holiday block from last week that I was waiting for the background to arrive, but for this week’s progress, I’m pretty happy. 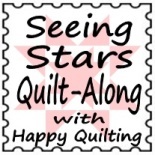 So, for week 2 of the Seeing Stars quilt along, I’m claiming success! I am glad that you found curves weren’t as scary as you thought they might be 🙂 That is what quilt along’s are all about!!! And I love your fabric combo’s they look awesome!!! I have to say, if the hardest part is matching fabrics, that is great news. And where you are using the same fabric lines for each, no matter what combo’s you do, they will look amazing in the end when it all comes together!!! Way to go on getting both sets all pieced and done. The points look fantastic and your curves are all lying nice an d flat, perfect!!! 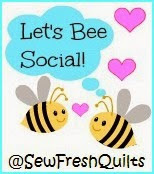 And you are welcome to link up your progress for each quilt seperatly if you wish, then you have two chances to win since you are making 2 quilts!!! If it is to much of a hassle for the weekly prizes I totally understand, but I wanted to let you know that for the grand prize at the end, totally link up your two quilts seperatly 😉 Great job on all of your beautiful blocks!! !